Shame, shame! I had to bring work home this weekend. I was behind! But this evening when I felt I had made some progress I let myself put up my tree. It is way early, I know, for traditionally minded folks like me. Some of my close friends will admonish me. I will have to keep my fingers crossed and hope they are pacified with some eggnog. Or perhaps some Bailey's Irish Cream which, who knows, I just might make again this season. Either that or I could just genuinely apologize and say I could not help it. I am not alone! 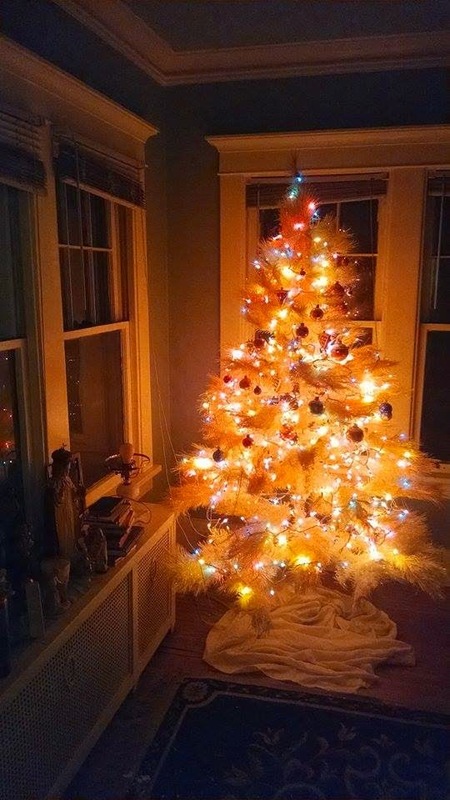 I know a lot of traddies just like myself and most of them have put their trees up. Especially the ones with kids. It just cannot be helped. Technically the Christmas season does not begin until Christmas Eve but that horse is out of the barn and it cannot be put back in overnight. So, my tree. It is the Martha Stewart white fake tree I got from Howard. I realize taking it out of the box that it has become a bit yellowed. It is because I have always put it in the window. Now I see you are not supposed to put it in direct sunlight. Of course I did not bother reading the instructions any of the other years. So that is another horse that is out of the barn. Who cares, after dark it still looks great. And that is when you enjoy your tree, in the evening. And I do enjoy it. Leonard Pennario loved Christmas and so do I. And so does Jeoffry! He was into this tree idea from the beginning, as you can see from that picture. I texted that picture to my sister Margie who got a kick out of his orange ears. Margie is so sweet and she recognizes artistic greatness when she sees it. I can tell you exactly how many lights there are on my tree. There are 600! 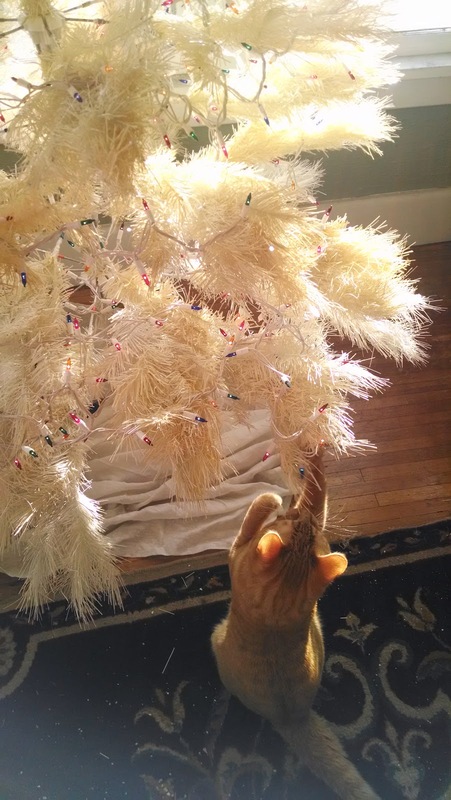 My friend Ryan gave me a wonderful present last year, three sets of LED lights made especially for fake white trees. Other years, I used old strings of lights with dark green strings. Ryan got these lights marked down after Christmas at Kmart. There are 200 lights in a pack and he gave me three sets so I used all of them, every last light. 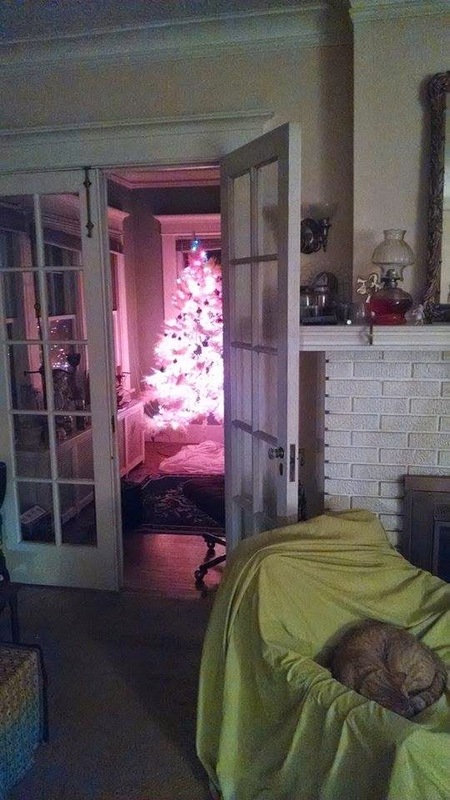 You cannot see my tree for the lights! It is hard to see but the tree is topped with a blue light. I arranged the light string that way in tribute to Kmart, because of Kmart's Blue Light Special. Right now Jeoffry and the tree are content to co-exist. I hope they stay that way!